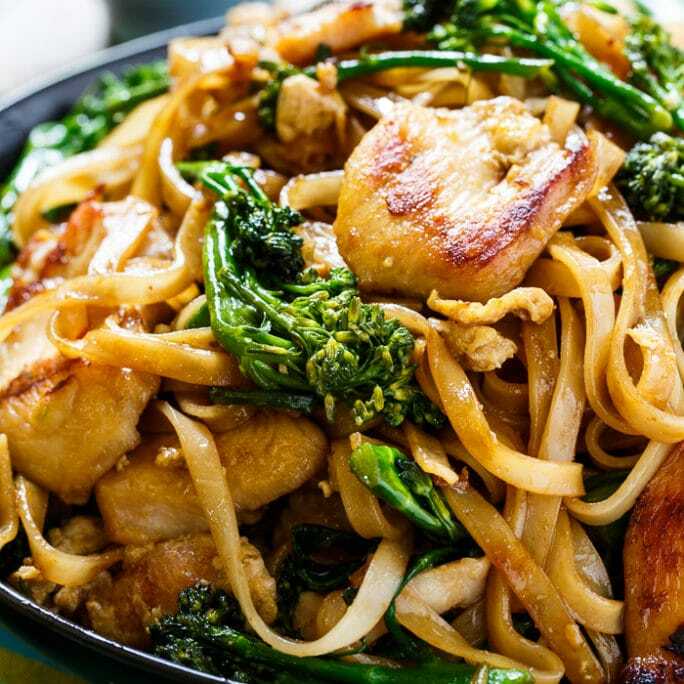 This Thai-Style Stir-Fried Noodle recipe from Cook’s Illustrated is a definite keeper, producing restaurant quality (or better!) noodles in the home kitchen. 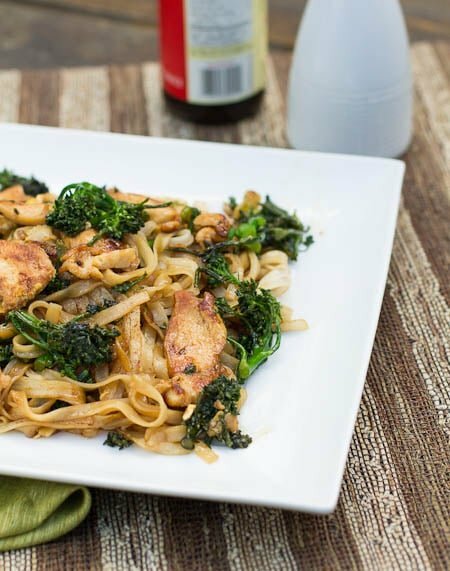 The chicken stays phenomenally moist and flavorful, the broccolini cut into bite-sized pieces adds crunch, and the rice noodles soak up all the wonderful flavors of the sauce. For someone hoping to learn how to cook or increase their kitchen repertoire, there is no better resource in my opinion than Cook’s Illustrated Magazine. Their recipes ALWAYS WORK and they always result in delicious food. Plus there is a thorough explanation of not only the method and why it works and what doesn’t, but they also steer you towards the best brands to use. If you have an interest in science like I do, you will learn a great deal from Cook’s Illustrated about kitchen science. For example, the trick in this recipe of raising the chicken’s pH to help keep it moist and tender. So many of my favorite recipes are from Cook’s Illustrated including Chewy Chocolate Chip Cookies, Salmon with Pomegranate-Balsamic Glaze, and Oven Barbecued Beef Brisket. 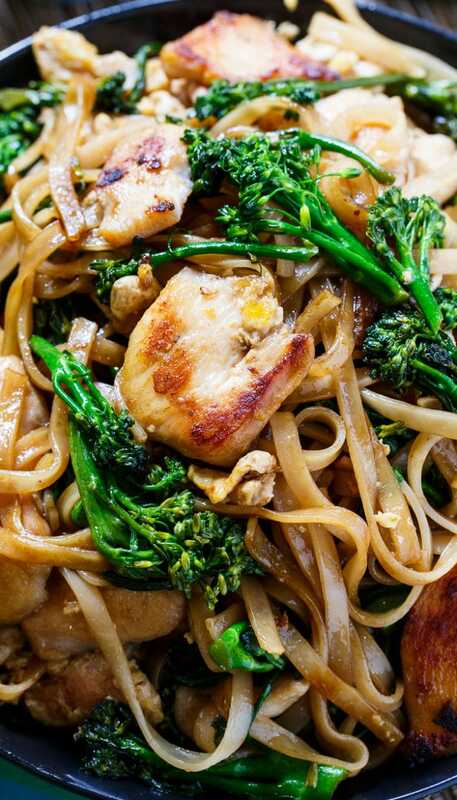 The most important thing with this recipe or any stir-fry recipe is to NOT STIR. 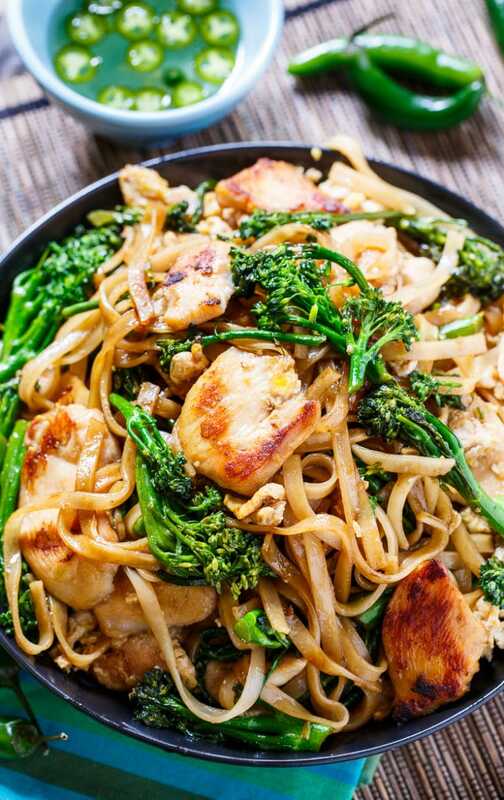 It seems counter-intuitive, but to develop a nice sear in the noodles, chicken, and vegetables, it’s necessary to leave the food alone while it’s in the skillet. Otherwise the food will steam instead of brown. Giving the chicken a soak in a baking powder/water solution before cooking raises its pH and prevents the chickens’ proteins from bonding together tightly which enables you to leave it in the pan longer without the risk of it becoming dry and chewy. I used A Taste of Thai Wide Rice Noodles and Lee Kum Kee Panda Brand Oyster Sauce . In a small bowl, combine rice vinegar and serrano and let sit at room temp for at least 15 minutes. Combine chicken with 2 tablespoons water and baking soda in a bowl. Let sit at room temperature for 15 minutes. Rinse chicken in cold water and drain well. Meanwhile, bring 6 cups water to a boil. Place noodles in a large bowl. Pour boiling water over noodles, stir, and let soak until noodles are almost tender, about 8 minutes. Stir halfway through the soaking time. Drain and then rinse with cold water. Drain well and toss with 2 teaspoons vegetable oil. 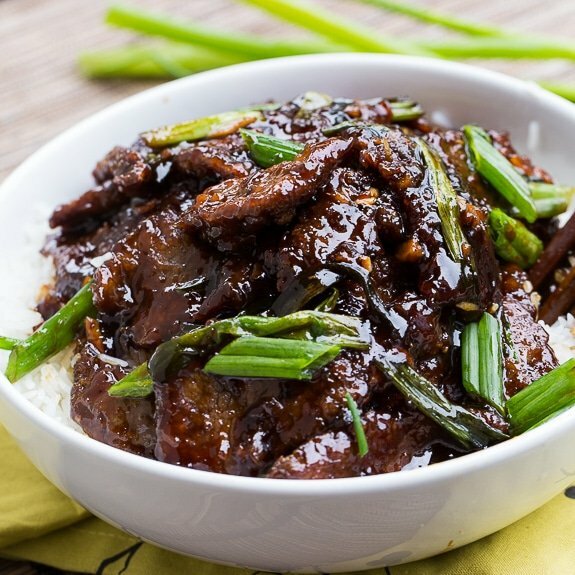 In a small bowl, mix together oyster sauce, soy sauce, sugar, vinegar, molasses, and fish sauce. Set aside. In a 12-inch nonstick skillet, heat 2 teaspoons oil over high heat. Add garlic and cook, stirring occasionally, for 1 to 2 minutes. Careful not to burn garlic, but you do want it to turn golden brown. Add chicken and 2 tablespoons sauce mixture. Spread chicken out in an even layer. Let chicken cook without stirring for 1 to 1 ½ minutes, until it begins to brown. Use tongs to turn chicken and continue to cook without disturbing until second side is browned, about 1 to 1 ½ minutes. Push chicken to 1 side of skillet. Add 2 teaspoons oil to empty side and then add eggs. Gently stir eggs using a rubber spatula until eggs start to set. Stir eggs and chicken mixture together, breaking eggs into pieces. Continue cooking for 30 to 60 seconds, or until eggs are fully cooked. Transfer mixture to a bowl. Place 2 teaspoons oil in the now empty skillet and heat over high heat until smoking. Add broccolini and 2 tablespoons sauce. Toss to coat. Cover skillet and cook for 2 minutes, stirring halfway. Uncover and continue to cook 2 to 3 minutes, until broccolini is very brown in spots, stirring just once. Place broccolini in bowl with chicken mixture. Heat another 2 teaspoons oil in skillet and add half of noodles and 2 tablespoons sauce and toss to coat. Cook for about 2 minutes, until noodles start browning in spots, stirring just once. Place in the bowl with chicken mixture. Repeat with remaining 2 teaspoons oil, noodles, and sauce. When second batch of noodles is starting to brown, add all of the contents back to skillet and toss to combine. Leave alone to cook for a final 1 to 1 ½ minutes. Serve immediately with chili vinegar as a condiment. Disclaimer: Spicy Southern Kitchen is an amazon.com affiliate. 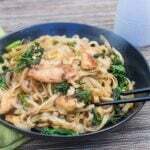 This entry was posted in Main Dishes and tagged chicken, cook's illustrated, poultry, rice noodles, stir-fry, thai. Bookmark the permalink. Can I substitue chicken for veggues like squash? 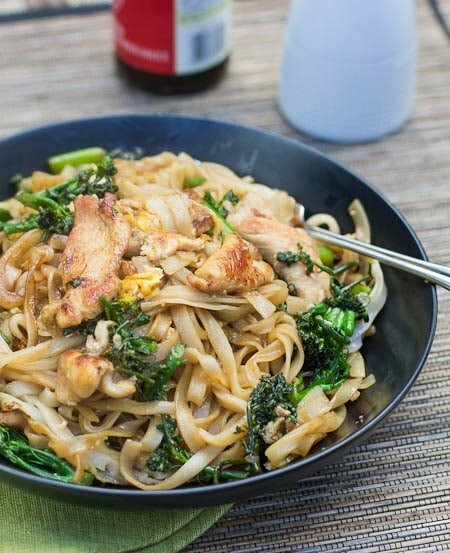 This seems very similar to pad see ew – my favorite thai dish – so I’m sure I would absolutely LOVE this dish! Can’t wait to try it for myself! It’s amazing Chung-Ah, as all the Cook’s Illustrated recipes are. Ohhh emmmm geeeee…this *might* be my favorite thing you’ve ever posted! Totally up my alley!